Daily Design #365. I did it! Daily Design #365! Well here it is, the last day and last design of my challenge. 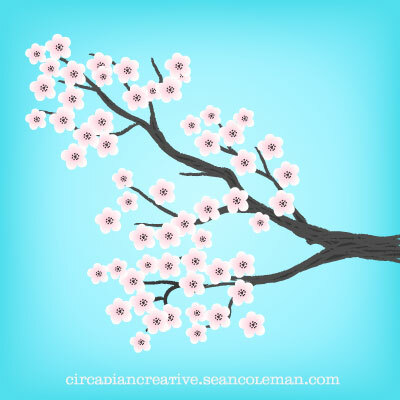 Today I finish where I started a year ago, with an illustration of cherry blossoms, this time they are created on a Wacom digital tablet. I thought it was appropriate to end with an illustration. This one was created more manually than the one that kicked off this challenge last April 1st. I encourage you to read my first post as well as read my comments below to learn a little more on what I’m taking from this experience. I want to thank all of you again. 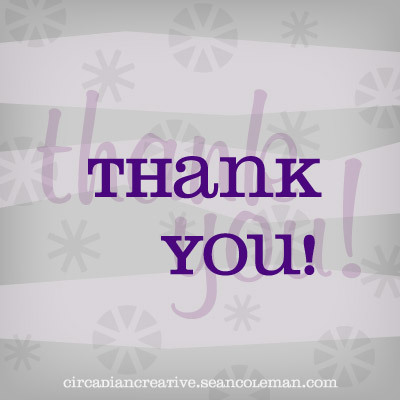 Visitors, subscribers, Facebook fans and Tweeters, thank you so much for sharing this journey with me. Of the many things I’ve learned about my design sensibilities this year the thing that stands out the most is my natural gravitation toward illustration. It is sadly a lost art for me. I started my artistic life, as a young child, as a “draw-er”. I was a crude illustrator who quickly gained the notoriety of the grown ups in my life. For my age, I had considerable talent and I got better in time. 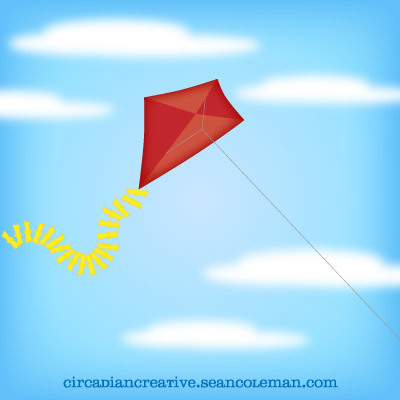 I continued, loosely, on the artist path throughout my growing and adult years, but always putting the artist thing in the back seat rather than making it a primary force in my life. Even in my career as a graphic designer, I have minimized the importance of my natural abilities as an illustrator. Always focusing on gaining a better understanding of things like color and typography. Never allowing myself to paint a picture with… well, pictures. Even with the Circadian Creative project I tried to retreat from illustration. After October’s Wacom Tablet theme, I quickly retired my digital tablet to my office drafting table where it sat until today, collecting dust. But despite my resistance you will notice that even on the simplest of levels I often fell back on basic illustrations in my designs. Don’t get me wrong, I still love, and strive to improve in the areas of typography, and color, and balance, and all aspects of design and visual communication. I also value how the Daily Design challenge has changed and improved my outlook and experience with these things. I will always be a typophile, drooling over retro and vintage typefaces, or exploring the intricacies of typographic character forms. I will continue to enjoy my struggle with color theory and color schemes and the challenges of directing the behavior of the readers eye. However, what I will take with me into 2011 and beyond is a renewed respect for illustration. I will think about how to integrate these items into design with all the other ingredients. It’s been a fascinating journey. There are some images here that I am really proud of. And, there are some that I could do over if given the chance, but I wouldn’t change a thing. I will revisit all of these images for years to come to serve as both a reminder of the great things I can do, as well as the things I can do better. The overall collection of images will remind me of the virtues of perseverance and dedication. There were days when I was excited and inspired and I could not wait to start and finish a design. Some days I felt like skipping a day. There were still other days when I was very concerned that I would have to skip, whether I wanted to or not. But here, at the end of the line… I did it. I did it! Daily Design #364. Thank You! Daily Design #364, Wow, what a year! It’s almost over and I want to stop on this second to the last day to thank all of you who have stopped by and taken in what I’m doing. 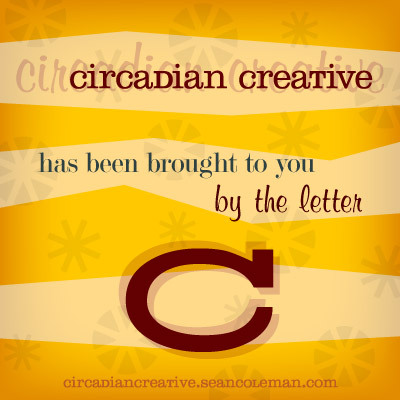 Thank you for subscribing and commenting and rating the designs. Many of you have helped promote the project. Duran Duran and Cake just to throw out a couple of big names. I have also had the opportunity to work on some specific projects, both professional and personal. Bonsai Empire and The Grannies come to mind. Saving the best for last, I have to thank my dear Colleen for logging in and commenting on every single post. Really, I don’t think she’s missed a day. She has also pushed me on a couple of occasions to post even when I had a good excuse to miss a day, like last month when my laptop died in the middle of a design. This project has been so much more rewarding than I ever thought it would be and I thank all of you who have followed along and supported me for the past 12 months. Please browse the site and rate your favorite, and least favorite, designs. I will be publishing the top 20 posts sometime next week. See you all tomorrow. ~Sean. Daily Design #363, and the last palindrome number of the daily design challenge. 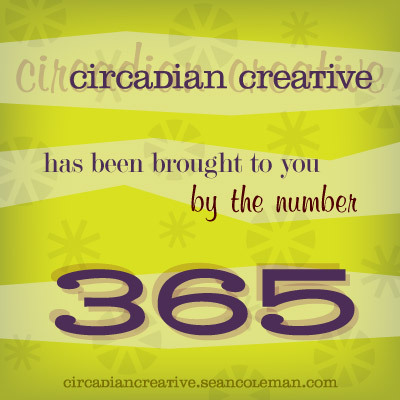 Circadian Creative was brought to you in part by many numbers, including the number three hundred sixty-five. Daily Design #361. 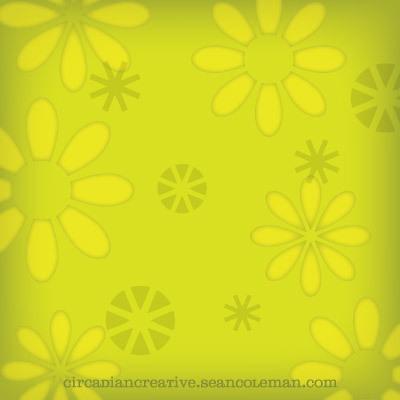 Today I am eagerly anticipating Spring. We were supposed to get and inch or two of snow over night but did not. I was happy about this. I am ready for the grass to take on a deep, vibrant green color and the trees to start putting forth their leaves and blossoms. Warmer weather would be a plus too, today is bit chilly. See you all tomorrow. ~Sean. Daily Design #360. Today I am recycling my sky from the last two posts. 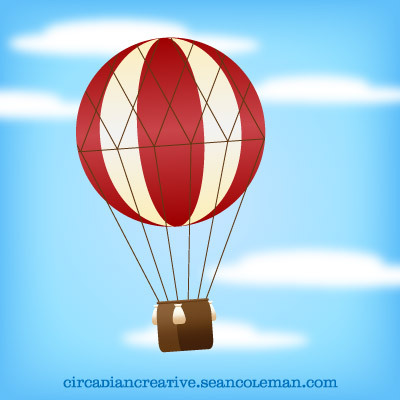 First we had a kite, next we had a night sky with a crescent moon and today we have a hot air balloon. Only five more days to go! Please take some time to browse the past year of designs and images and rate as many as you can. I would like to post the top 20 and perhaps the bottom 10 in a week or so after the daily design challenge is over. So you get to be the judge! See you all tomorrow. ~Sean. Daily Design #359. For today’s design I guess I’m thinking about going to sleep. 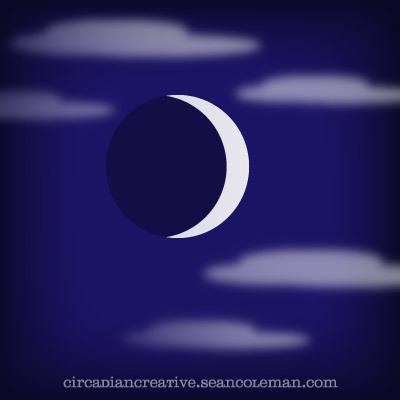 The crescent moon has always made me think of the feeling you have just before settling in for the night. It’s been a long day and you are just ready for peaceful, restful sleep. Tonight as I was creating this image I was informed by Colleen that something very sad had been announced. Remember The Grannies logo, and the TEAM GRANNIES design from last weekend? The designs were created for two elderly cats who have had a tough lot in life recently until they were adopted by a loving person and given a forever home. These two have been a hot item on Facebook recently. They have hundreds of fans and are an inspiration for the cause of adopting senior pets. Their names are Juliet and Kate, and I am very sad to report that Kate passed away today after being ill for several days. I would like to dedicate this design to Kate the cat, who with her sister Juliet is inspiring senior pet lovers all over the country. Rest in peace Kate. See you all tomorrow. ~Sean.